Sight words are words that don't follow common spelling conventions. Examples include "does" (as in "That does make sense.") or "who" (as in "Who is the tallest?"). You can't sound them out in order to spell them. Rather, their spellings need to be memorized. Some of the most commonly misspelled sight words are words we use every day. And that's why teachers are so instrumental when it's time to conquer them. There are an array of words that can be confusing even if they're popular sight words. For example, homophones are confusing because they sound alike but are spelled differently and have different meanings. There are a few homophones on the sight words list and, if students get confused, they may use the wrong word in a sentence - which technically isn't a misspelled word. To/Two/Too - "To" and "two" are sight words and they are also homophones. It is a contextual issue wherein the context of either "two" or "to" is used wrong, as well as the third "too." There/Their - "There" and "their" are also popular sight words that are often misused or misspelled, plus "they're" as another homophone. Once again, it has much to do with the context in which the word is used in a sentence. Ate/Eight - These are two more possibilities for misuse or misspelling from the sight word list. If you'd like to post another chart in the classroom, here's a handy printable containing commonly confused words. Of course, there's more than one way to help little learners master sight words. You can consider one of the three approaches below and then bolster them with any number of in-class activities. One of the best places to start is a simple lesson using each of the commonly misspelled words in the proper context. For example, you wouldn't use the word "two" in the sentence, "I am going to the store." Students can learn this by sight with the appropriate in-class illustration. Beyond that, flash cards are a popular way to drill sight words. Students can create their own online flash cards here and share them with their friends. Word walls are another alternative. These are simply a collection of words displayed in a prominent place in the classroom. Feel free to post the printable, say, in the reading corner of your classroom. Students can refer to it when in doubt. When dealing with sight words, games and worksheets are very beneficial. These words can certainly be learned through repetition. If your students are too young for online flash cards, why not make up a few in-class flash cards with your students? You can help them write their own flash cards using PowerPoint. Prompt them to write each sight word on an index card as you advance through a slideshow. If you add some fun animations to the presentation, it'll make each sight word all the more memorable. A rock solid way to keep students motivated is to have a spelling bee. The incentive for spelling the sight words correctly would undoubtedly be a treat of some kind. This would be a good way to assess everyone's ability to spell sight words correctly. Another idea that should help students avoid sight word spelling errors would be to make a few worksheets where there are word boxes or crossword puzzles for the students to complete. Here's a free downloadable worksheet where students must fill in the blanks with high frequency sight words. There are also a wealth of sight word games for kindergarteners through third graders. If you choose to play Hangman or Jeopardy, you can separate the class into small teams so they can help one another. Beyond that, try using modeling clay to sculpt sight words. Kinesthetic learners always love that activity. Dr. Edward Dolch was the master of sight words. He created comprehensive word lists for students in kindergarten through third grade. Sightwords.com features those lists. Then, Edward Fry came along and expanded those word lists all the way up to the tenth grade. 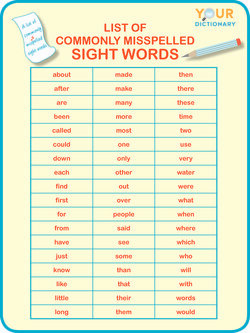 It might be nice to print out these lists for your students, taking them beyond commonly misspelled sight words. As you review these sheets with your students, be on the lookout for homophones. Although they might not always be misspelled, they can be interchanged in error. And this is a nice time to help your learners evade that common pitfall. "Commonly Misspelled Sight Words." YourDictionary, n.d. Web. 24 April 2019. 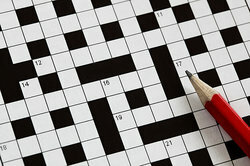 <https://education.yourdictionary.com/spelling-and-word-lists/commonly-misspelled-sight-words.html>. Sight words are words that don’t follow common spelling conventions. Examples include “does” (as in “That does make sense.”) or “who” (as in “Who is the tallest?”). You can’t sound them out in order to spell them. Rather, their spellings need to be memorized. Some of the most commonly misspelled sight words are words we use every day. And that’s why teachers are so instrumental when it’s time to conquer them.